Its been nearly a month since I released PerfMatters.Flush on NuGet. The library has been getting people talking about performance and thinking how to improve their web applications. @nikmd23 @dahlbyk should totally call this “CourtesyFlush”. 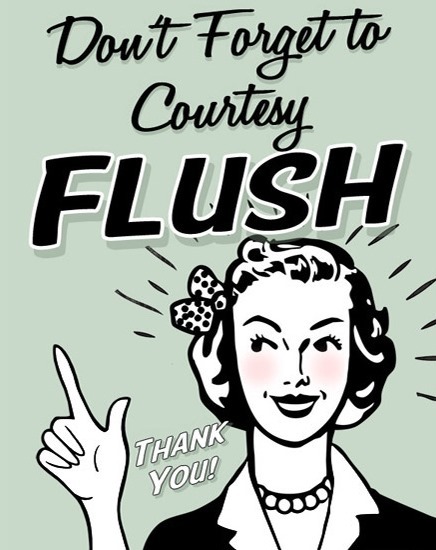 For the uninitiated, a courtesy flush refers to the first, early flush you do in the restroom to avoid stinking the place up. My library is basically the same thing, except, in a much more hygienic environment. Flushing your HTTP response early also provides everyone a benefit. All that to say I’ve decided to rename PerfMatters.Flush to CourtesyFlush. I’ve “redirected” the old package to use the new one, so you don’t need to worry if you were using the old library. In addition, I’ve also added support for .NET 4.0 in this release. In my previous two performance related posts I’ve gone on and on about the benefits of flushing an HTTP response early and how to do it in ASP.NET MVC. If you haven’t read those yet, I recommend you take a quick moment to at least read Flushing in ASP.NET MVC, and if you have a little extra time go through More Flushing in ASP.NET MVC as well. I think those posts did a decent job of explaining why you’d want to flush early. In this post I’m going to dig into the details of how to flush early using my library, PerfMatters.Flush. The core of what you need to know to use PerfMatters.Flush is that I’ve tried to make it easy to use by providing a few different usage models. Pick the one that works best in your scenario, and feel free to mix and match across your application. The attribute can be used alone for HTML documents with a static <head> section. Optionally, a Title property can be set for specifying a dynamic <title> element, which is very common. As you can see, this mechanism allows for very dynamic <head> sections. In this example you could imagine a <title> element, <meta name="description" content="…"> attribute (for SEO purposes) and <link rel="dns-prefetch" href="…"> (for performance optimization) all being set. In this case we pass a Func<ActionDescriptor, ViewDataDictionary> to the FlushHeadAttribute constructor. That function is executed for each action method. This example is pretty contrite since the result is deterministic, but you can see both a custom model (CustomObject) and ViewData in use at the same time. In real world usage the actionDescriptor parameter would be analyzed and leveraged to get data from some data store (hopefully in memory!) or from an IOC container. Getting up and running with PerfMatters.Flush is as easy as installing the NuGet package. Notice the @Html.FlushHead() method on the first line? That’s the magic that stiches this all together. It allows you to use MVC the way your used to on action methods that you don’t want to flush early, and opt-in (via one of the usage model’s described above) when you do. PerfMatters.Flush has been fun for me to work on. It’s currently being used in production on getGlimpse.com and has nicely boosted perceived performance on the pages that do any database queries. To be honest, I wish that PerfMatters.Flush didn’t have to exist. I’ve asked the ASP.NET team to look into baking first class support for flushing early into the framework, but I don’t foresee that happening for quite awhile. Either way, there are tons of application built in MVC 3, 4 and 5 that can leverage this now. The project is open source, and the code is hosted on GitHub. I’d love to hear your feedback on ways to make it better and easier to use. I spent the better part of two days pulling my hair out about a bug report claiming a website that opened an OleDbConnection to Microsoft Access would break Glimpse, my open source project. I couldn’t believe it. Glimpse knows nothing about OleDb or Access, but alas, the bug was reported and I was able to reproduce it. With reproduction in hand, I quickly figured out what was really happening. Opening the connection to Access caused the current AppDomain to unload, which in turn tore down Glimpse’s internal data stores resulting in the undesired behavior. But why was the AppDomain being unloaded? I know tons of applications out there, running on little web servers underneath people’s cubicle desks, leverage Access as a data backend. Surely they don’t recycle the AppDomain after every database connection, do they? Once I correctly understood modern ASP.NET’s behavior, I realized that connecting to the .MDB Access file in my bin directory was causing the file system watcher to kick off an application domain unload. Awesome! I moved the database out of the bin and the problem was solved. Of course, after wasting more than a day of tinkering with this, I thought “There must be a way to figure this out without Google’ing high and wide”. Turns out, there is! Unfortunately it’s not very obvious and requires some private reflection. Scott Gu covers the technique in a blog post from late 2005, before I was even involved in .NET. The shutDownMessage will be a string describing the exact reason why the AppDomain is being recycled – which is great to log and saves lots of guess work. Now that I know this technique, I have now begun logging all AppDomain recycles within Glimpse’s internal log in an effort to aid diagnosis of future problems like this. It’s amazing just how easy it is to take for granted the mountain of code we build on top of everyday. This year I’m really going to try and not gloss over the lessons learned by those who came before us – just a mere 8 years ago. It’s no secret that my love of web development has materialized into Glimpse, the project I started a little over a year ago with Anthony Van der Hoorn. I’ve had an amazing ride with Glimpse; becoming an ASP Insider, getting to meet many of my dev heroes and working with fantastic contributors from all around the world. About a month ago that ride took a new and unexpected turn. An opportunity to work full time with the open source community on our little project arose from a seemingly unexpected source: Red Gate. I was taken surprised by Red Gate’s proposal and spent several weeks with Anthony and Red Gate’s top brass discussing our philosophies of open development, open source, ASP.NET, the web development community, software development practices and yes, even Reflector. As the discussions progressed I became more and more convinced that Red Gate genuinely believed in our vision of Glimpse, our model of development, and most importantly, the community that we were serving. Given that, I decided to take a new job with Red Gate – getting to focus a much larger portion of my time on the things I love: Glimpse and the web development community. There are a lot more details about what this means for Glimpse on the Glimpse blog, so I won’t rehash that here, but in summary it’s all positive. From a personal perspective, I will remain in New York City, and, in addition to spending a majority of my time working on Glimpse, I have also been given the opportunity to interact with the community. This basically means that part of my new position requires writing blog posts, speaking at user groups/meetups, working with open source and attending conferences like Monospace in October. This is all new and very exciting to me. Keep an eye on this blog and my twitter feed for updates as things progress. The presentation started with a quick demo of Windows 8 running on Rachel’s tablet. It was all pretty standard stuff if you’ve seen Windows 8. If you haven’t – head straight over to the Building Windows 8 blog and read up right away! To build Windows 8 apps, you have to have Visual Studio 2012 running on Windows 8 itself. Visual Studio 2012 does work on Windows 7, you just can’t create Windows 8 Metro apps with that configuration. There does not appear to be a built in UI pattern like MVC or MVVM. I assume that libraries that help structure code, like backbone.js or knockout.js, will be popular. There is a concept of “pages” (not HTML pages) built into the template. These were not covered in depth – I need to research this more. I was happy to see the ECMAScript5’s “use strict” directive in use in the template code. Running (IE:F5 Debugging) an application from Visual Studio causes the application to open up in full screen mode. This makes break point debugging very painful with lots of Alt+Tab window switching. A simulator (not emulator) can be used to ease this pain. The simulator is basically a remote desktop connection, back into your own machine, which shows the application running along with tooling to do things like rotate the device orientation and simulate touch events/gestures. Visual Studio tries to guide developers into properly implementing the Metro UX guidelines. A full set of documentation and resources can be found in the Windows Dev Center. Interesting point made about the reduced relevancy for HTTP caching/CDN’s in HTML based Metro apps since a majority or resources (sans data/JSON) will be included in the bundle. Html “controls” use standard elements (IE: divs) with data-* attributes. Application manifest file (XML) contains tons of settings, but there is a nice editor for the file that hides away the XML and makes editing “easy”. Access to device API’s (camera, geolocation, etc) must be approved by user, similar to Facebook’s permission model. Applications can have many entry points like a tile click or a search result. Side loading of applications is handled by Visual Studio. Tiles can be short (square) or wide (rectangle), live or “dead” – users choose and developers should accommodate those preferences. All in all, it was a very informative session. It was video recorded, so I’ll update this post as soon as the video is posted online. This post is all about getting SpecFlow, my favorite .NET BDD framework, and xUnit, my favorite .NET unit testing framework, playing along nicely together. Create a standard Class Library project in Visual Studio. Using NuGet, add the packages SpecFlow, xunit and xunit.extensions with either the Package Manager Console or Manage NuGet Packages dialog. xunit.extensions is required for some of the more advanced Gherkin syntax scenarios. That’s it, SpecFlow will now generate xUnit tests which should compile perfectly. I’ve wrapped all of these steps together into a NuGet package, tentatively titled SpecFlow.xUnit, and contributed it to the SpecFlow project on GitHub. They have just accepted my pull request, so hopefully we’ll see a one click package to integrate these two great libraries on NuGet.org very soon! 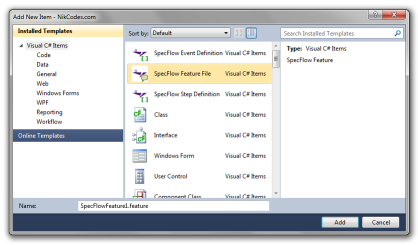 Of course, the real beauty of SpecFlow is its Visual Studio integration, which you can install from the Visual Studio Extension Manager. It provides item templates and step debugging on Gherkin .feature files. 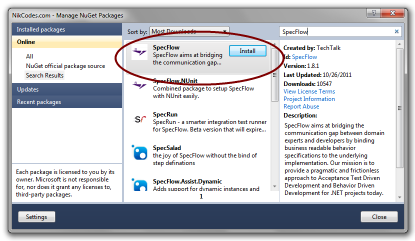 I have a few issues with the way that Visual Studio’s Extension Manager works, but that’s another post and has nothing to do with SpecFlow. Consuming JSONP services is ridiculously easy and has had support built into jQuery since version 1.2. Unfortunately, ASP.NET MVC does not ship with JSONP support out of the box, but it is easy to add with the great extensibility points available in MVC. Here is an implementation of an MVC ActionResult which would enable any controller to begin to return proper JSONP results. Of course, cross origin resource sharing (CORS) is much more powerful that JSONP, and will ultimately replace it – but until then, or as long as we have < IE 10, we will still have to leverage this technique. Download the code, try it out. Let me know if this is valuable enough to put on NuGet. Big thanks goes out to Carl Franklin and everyone at Pwop Productions! They let me hang out at the studio a little but late Wednesday night – and even had me on the Dot Net Rocks podcast as a special guest for a few minutes! Check out episode 362, and all of Carl’s great content! This message is not particularly helpful. If you run into this issue you might want to check that your mail server will allow SMTP relays. My server was set to allow SMTP relays – yet I was still getting the issue. I found a Microsoft tool called SMTPDiag (for use with Exchange server) that runs through the network performing various test to find out why SMTP is not working. I ended up failing on one of the final steps – connecting to the exchange server. on the server and found that port 25 was open and listening. This refused to connect as well. I checked the firewall to see if port 25 was blocked in some way and it was not. I was basically flabbergasted and about to give up when my anti-virus program popped up to do an update. A light bulb went off in my head. CHECK YOUR ANTI-VIRUS SETTINGS WHEN HAVING CONNECTION PROBLEMS! McAffee ANtiVirus was blocking all outgoing traffic over port 25 on my machine. I didn’t even think about anti-virus blocking ports, but it is quite common, especially with mail ports. I felt like an idiot, but I decided to share my experience to help others out there. PS – SMTPDiag is quite useful, and Marc Grote has a good tutorial on it.